The aim of our programmes are to support the development of athletes through an environment of sporting and professional excellence. The development of athletes’ physical, mental and technical performance attributes are key themes within our programmes, enabling Britain’s future archers to maximise their talents leading ultimately to medal success at senior international championships. The National Talent Development Programme (NTDP) is fully inclusive. All young athletes who are keen to improve, including those with disabilities, are actively encouraged to sign up. The NTDP is open for any athlete under the age of 20. In 2018, the programme was also extended to compound archers. The NTDP is the key connect between the grass roots Talent activity of our sport, including ontarget Performance Clubs and our HCSC (Home Country Sports Councils) Talent Pathway. We piloted this programme in 2012 and it has been highly successful as a means of defining and refining our Talent pool. It is an inclusive programme, with no criteria to register except age. Archers attend quarterly coaching and benchmarking days throughout the year and are profiled in August at the end of the cycle. 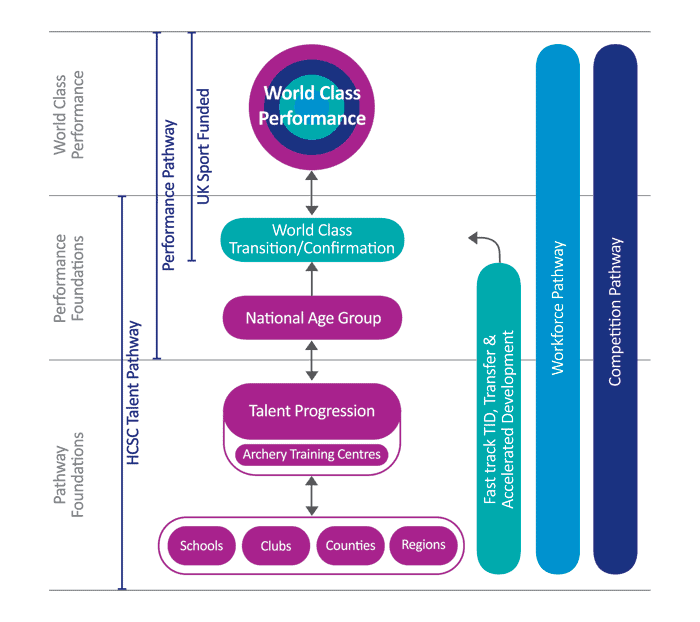 Those demonstrating talent against the what it takes to win criteria can be selected to the National Age Group Academy, the induction for which takes place each September. Following feedback from athletes, parents and coaches, the 2018 National Talent Development Programme will pilot a Southern camp at Aim4Sport to complement the existing Lilleshall based camp. Once good practice and quality of experience is assured then the NTDP camps will be expanded in the 2019/20 season to Midlands and Northern areas in conjunction with our ontarget Performance Club programme.